Barbara Elder came to Nantucket in 1981 to serve as director of Nantucket Community Music Center (NCMC), a position she held for 10 years. She was Music Coordinator of the Nantucket Public Schools for 25 years and recently returned to the role of executive director of NCMC. She is also choral conductor of the NCMC Chorus as well as the Women’s Chorus of Nantucket and has been involved in productions of Theatre Workshop of Nantucket and Actors Theater of Nantucket. Beverly has been a professional photographer on Nantucket for over 40 years, well-know for her evocative and profound imagery. In 2002, she received her Masters of Divinity from The Episcopal Divinity School in Cambridge, MA. She is the founder of the annual Shakespeare in the Garden performance and celebration, and is a long-time member of the Nantucket Arts Council Board of Directors. Russell has lived on Nantucket year around for 17 years and is presently Director of Business Operations for Hyperion Maritime Holdings LLC. He received his degree in economics and management science from SUNY Cortland and previously worked in commercial lending at Nantucket Bank. 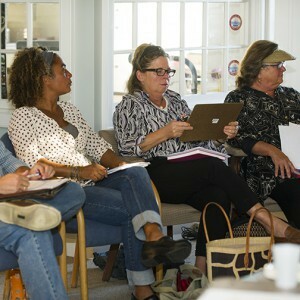 Russell has been treasurer the Nantucket Arts Council Board of Directors since 2016. When he isn't looking over budgets and financials, you can usually find him fishing at Great Point. Gene is a former President of the Nantucket Arts Council and currently serves on the Board as Secretary. He is the owner and publisher of the Mahon About Town Arts & Social E-Newsletter celebrating the best of Nantucket. He's President of Nantucket Community Television, and serves on the boards of the Nantucket Comedy Festival and Nantucket Visitor Services. Jill Sandole takes eye-pleasing photos of Nantucket scenes, beautifies the island with plant and flower arrangements as a longtime member of Nantucket Garden Club, creates exquisitely colored ‘pysanka’ Ukrainian Easter eggs, and occasionally dances on stage. 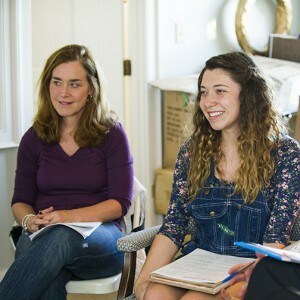 A former teacher’s aide in Nantucket Public Schools and a dance-fitness instructor, Jill has helped organized and present dozens of arts and cultural events on Nantucket, including as former event planner for Bartlett's Farm. Carol discovered Nantucket in 1986; then visited their island home frequently with her family until she and her husband became full-time residents in 2016. After receiving her Bachelor of Education from St. Bonaventure University, she began her administrative career at Price Waterhouse & Co. in New York City. She later relocated to Connecticut, where she shifted her focus from accounting to legal work. Reggie has been a witness to the arts and culture of Nantucket Island for many decades and has been at the center of Nantucket’s arts renaissance. He is one of the original founders of the Nantucket Arts Council, and served as President several times. He has also been a professional art conservator and restorer, set designer, actor, lecturer, and an accomplished artist painting in a variety of media.